What is the GP Study app about? 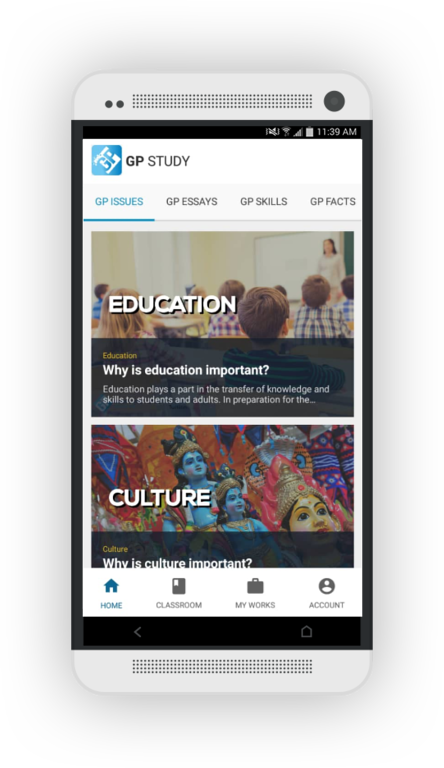 GP Study is a mobile learning application for JC students to explore and understand the significance of real world issues that are featured and tested at the GCE A Level General Paper examinations. This app contains many easy-to-use features that will enhance your revision efforts, such as visually-attractive GP Facts infographics and the comprehensive GP Issues. Ultimately, this app is an educational and exam-friendly tool that will revolutionise the age of online learning. GP Study features exciting features, like GP Issues, GP Essays, GP Skills and GP Facts that will provide a comprehensive coverage of various real world matters. By doing so, you will be equipped with the essential knowledge to analyse issues that are found in GP essay and comprehension questions during the examinations effectively. GP Issues covers many topics, such as the relevance of formal education in modern society, the problem of fake news and the challenges of environmental sustainability. Within each GP Issue, you will examine significant matters from multiple perspectives, such as the economic, political and social implications of technological advancement in the modern age. GP Essays contain many essay outlines and model essays that are written by our very own JC GP Tutors, who have based the essays on past examination questions. Refer to these essays to derive a better understanding of the possible approaches to answer the questions appropriately. Also, these questions are useful for self-revision purposes. GP Skills is a useful column for the discussion of important matters, like the key concerns when answering comprehension short answer questions and the application question (AQ). Additionally, this feature also covers the intricacies of essay writing skills, such as question analysis, introduction development and paragraph writing. GP Facts is a feature that will pique your interest in the study of A Level General Paper as it contains many fascinating facts and statistics that are based on different topics, like Education, Culture, Science and Technology, Social Media and Politics. Furthermore, you can use the given information in these Fact Cards to support your arguments in your answers. We offer additional learning features for motivated students. The GP Virtual Classroom is an exclusive and premium feature for app users who sign up for our GP Tuition programme. Within the Classroom feature, students can access additional resources, like GP Essays and Study Notes. Yes, you can write GP outlines to improve your essay writing skills on the GP Study app! Simply select the question of your choice and read the given instructions. After you have submitted your GP Outline answers, a model outline reference answer will be sent to you in PDF. Enhance your learning efforts by attending our GP tuition classes held at our very own tuition centres. In addition to the learning app, you can seek guidance from our JC GP Tutors and receive supplementary resources. Furthermore, the lessons include practice sessions for exam revision.